The work of a job hunter is never done. Historically, job hunting has been a very reactive process – you see a job posted on a job board or with a recruitment agency and you apply. The truth is, successful job hunting today is a proactive process. Many job openings never make it as far as a job board or a recruitment agency. 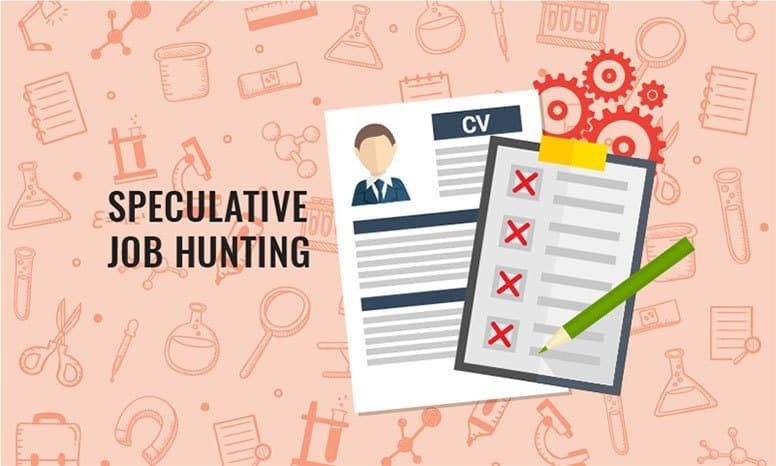 A speculative application is the process of sending your CV to a company even though they don’t have any advertised jobs that you’d be suitable for. The idea is that if your CV happens to land on the desk of a manager who’s thinking about starting a job hunt (or is already sitting on file within the company when they start to look), you put yourself front and center in the hiring process. Mastering this proactive approach to job hunting with speculative applications could vastly improve your chances of scooping a great job quickly. But this isn’t just sending out your CV to every company you can think of, this process is a targeted strategy that allows you to use your time productively. If you’ve done the above correctly you’ll have a central point where your home is and something close to a circle all the way around it – that is your commutable area.If you’ve stayed in the same place for a while then you might feel like you could skip this step. Don’t. Take the time to look at a map and consider all directions. Don’t start your search with too narrow a scope because you think you know the answer already. Now comes the slightly trickier part, identifying companies in this area. If you’re in Ireland, we’ve done all the hard work for you. You just need to head on over to our factory locator map, zoom into your area and skip to step 3. Put “[major town or region within your commutable area] pharmaceutical manufacturing” into google. Then do the same but replace pharmaceutical with medical device. For the most useful information, you could actually put the company name and its location into a search engine and see if there’s a dedicated area of the website for it. Search LinkedIn for useful connections. Obviously, HR professionals are a good place to start but also consider supervisors or managers of the department you’d want to apply to. If you’re professional in your approach, making connections here could be just what you need. Add them to any follow lists you keep. Do they mention going to any careers fairs or networking events that you could also attend? You’ll probably have a long list of companies. Realistically you need to prioritize that list to get the most important applications out the door as soon as possible. But how do you know which to prioritize? If you have contacts within a company, start there. Many successful speculative applications come from network contacts delivering a CV to the right person. Talk to people about the sort of jobs you’re looking for. Ask your contacts to let you know if they hear of people who are moving on or if there are recruitment events happening locally. Attend career fairs to discuss open vacancies but also to make connections with people who may be recruiting in the future. Monitor news sites for stories of companies expanding or moving into the area. There are several aggregator sites such as ‘Google News’ where you can search various news outlets at one time and set up news alerts. With an alert in place, you’ll receive emails when news stories matching your keywords are published. News stories of company expansions, new facility developments or increasing productivity are all things that will highlight jobs in the future. Once you’ve highlighted companies that are in the process of expanding or will be soon, identify key people within these organizations and begin networking with them using sites such as LinkedIn. This can help you develop relationships, find out where to monitor for updates and increase your profile within these companies. If you know there is a company that hired someone with a skill set similar to yours in the past, they should definitely be on your list. The only way to know this is through networking (or possibly internet research) so make sure it’s something you add to your list of queries for networking meetings when you arrange them. Begin actually making these speculative applications. Start at the top of your prioritized list and work your way down (unless some new information or connection bumps a company to the top of your list). Research the company and tailor your application and cover letter. Look at their website and their social media accounts to identify key priorities, values, and strategies. Highlight relevant interests and experience you have that matches against these within your speculative application. Show them that you’re specifically looking for a job with them. You’ll often be able to find old job adverts by searching a job title and the company name. This will give you a good idea of what they identify as the key skills and experience when hiring for that role. Use that language to describe your previous experience and skills where appropriate. DO NOT just send out the same generic CV and cover letter to all of these companies. Having someone pass on your CV is much more effective than an unsolicited email or letter in the post. If you know someone within the company, ask if they’d be willing to hand deliver your CV to the relevant person. If you found HR contacts on LinkedIn, address it to them. This is much more likely to get attention than a generically addressed envelope. Use the company website, LinkedIn or any network contacts you have to get this information. The goal of a speculative application is still to show what you can bring to a company, what you can do to help them meet their goals and solve their problems. The tone should never be “I’m a great candidate, you’d be lucky to have me”, and you should also work hard to avoid “I really need a job, please give me a job”. Keep the focus on what can you offer them as a candidate and how employing you would be good for them and for their business. As with any application, follow-up is crucial. Being careful not to make a nuisance of yourself, politely make contact with the person you sent it to if you don’t hear back from your initial application. Your primary source of applications should always be applying to jobs that are currently available (that you might find on a jobs board or through a recruiter). If you’re looking at 5 applications per week, as we recommend, only 1 or 2 should be speculative applications. Make speculative applications part of your weekly job hunting routine. Build time for it into your week and keep your rate of application steady. Many companies will keep a speculative application on file for a set period of time if a suitable role isn’t immediately available. In theory, this should mean that you’ll be contacted if a role that you might be a good fit for became available within that time. If you’re told this, make a note of how long your application is on file for. Just at the passing of that date, you should submit another speculative application if you’re still looking for a job. These tactics combined give you a great proactive job hunt. Using speculative applications as part of your job hunt is an extremely positive approach and gives you an ongoing focus, keeping a strong momentum and clear goals as you move forward. Of course, what is also means, is that the work of a job hunter is never done!